Who doesn’t love the Jeremy Lin story? Whether or not you are a basketball fan, it’s pretty hard to escape the catchy, punny headlines: Linsanity! Another Win for Lin! Lincredible! At 23 years old, Lin has defied all odds to help the New York Knicks win 8 of their last 10 games, including a decisive victory against the defending NBA champs, the Dallas Mavericks. Even Mark Cuban, the opinionated owner of the Mavericks, had to acknowledge that Lin is ‘for real’. Lin’s road to NBA stardom was not an easy one, nor was it predictable. His unwaveringly positive attitude – even in the face of racial slurs – is something every youth athlete can learn from. Frankly, I think it’s something everyone can learn from, but that’s not what this blog is about. Hard Work Pays Off – In high school, in college and after college, Jeremy Lin faced several setbacks and disappointments. Times when he could have – and many others would have, just given up. No universities offered him an athletic scholarship out of Palo Alto High School. Undrafted out of Harvard University, even after making the All-Ivy League First Team as a senior. Pre-season workouts with the Golden State Warriors, the Dallas Mavericks, and the Houston Rockets – all ending without a roster spot before getting picked up off of waivers by the New York Knicks as a back-up plan. No matter how many times he heard ‘no thanks’, Lin never wavered in his passion or his drive to improve and achieve his dream of playing in the NBA. Do you have the resolve to keep trying, even though you didn’t make the Class I team or Varsity squad this year? Or will you quit and let the naysayers win? Be a Class Act – So many of today’s role models are such poor sports. How many whiny, spoiled brats can we hear on TV and read about in Sports Illustrated? Jeremy Lin breaks that mold, and in a wonderful, classy way. In the face of a horrible ethnic slur in an ESPN headline, Lin brushed it aside, saying, “I don’t think it was on purpose” and moved on. Score 1 for the athlete’s character, 0 for the media who wanted him to be upset and proliferate the story for their ratings. In a game, if the ref calls you for a foul, will you scream at him and then continue to berate him after the game to all your friends, or will you brush it off and continue playing your game. If a player on the other team says something derogatory to you, will you keep your cool and rise above, or will you stoop to his or her level? There is no “I” in Team – I know it’s trite, but true. Watch Lin in every interview and read his Facebook posts and Tweets. He always acknowledges his teammates. He rarely, if ever, takes credit for anything himself. He’s given credit to his high-school teammates, his high-school coach, his college teammates and coach, and now his pro teammates and coach for helping him improve and be where he is today. He lets everyone know how much he appreciates them. Do you do that with your teammates? If you are a pitcher, do you tell your defense how much you appreciate it when they make the plays and help you out? If you are a goalkeeper, do you pump up your teammates when they keep the ball away from your end of the field? Everyone loves to be appreciated. Try it and see what happens. The results may surprise you. Focus on YOUR Goal, Not Your Parents’ – Jeremy Lin’s goal, not his parents’, was to be an NBA player. His dad taught him to play basketball at the YMCA and Lin fell in love with the game. His parents didn’t drive him 200 miles a week to play on a travel team or hire a private coach. They didn’t push him to do anything: Jeremy pushed himself. So many youth athletes I see today are playing at a highly competitive level not to satisfy themselves, but rather their parents. The drive to succeed and attain that college scholarship is mom and dad’s goal, not the athlete’s. If you’re really going to succeed—no matter at what—the passion and drive need to come from within you. Own it. Make your own future. Stop and Smell the Roses – But Don’t Linger too Long – You can tell: Jeremy Lin is enjoying every second of this. This is his dream and he’s living it. He’s got Spike Lee wearing his high school and his college jersey. All the hard work, all the determination, all the extra time in the gym is now paying off. He’s not resting on his laurels or taking a break, though. After last week’s loss to the Charlotte Hornets, Lin posted, “gotta learn from my mistakes and move on to the next one.” He’s back in the gym, working on improving his shooting style, with a mindset of someone who still has something to prove. When you win a game against a higher-ranked or ‘better’ opponent, do you enjoy the moment? Do you then relax and risk losing the next game to a ‘lesser’ opponent because you focused too much on your win? Or do you go right back to the gym, the field, the court, or the pool to keep improving? 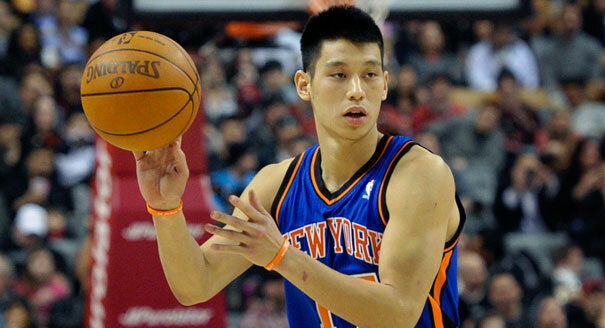 I’m sure some of you have ideas of how Jeremy Lin can inspire our kids—in athletics and beyond. Let me know!